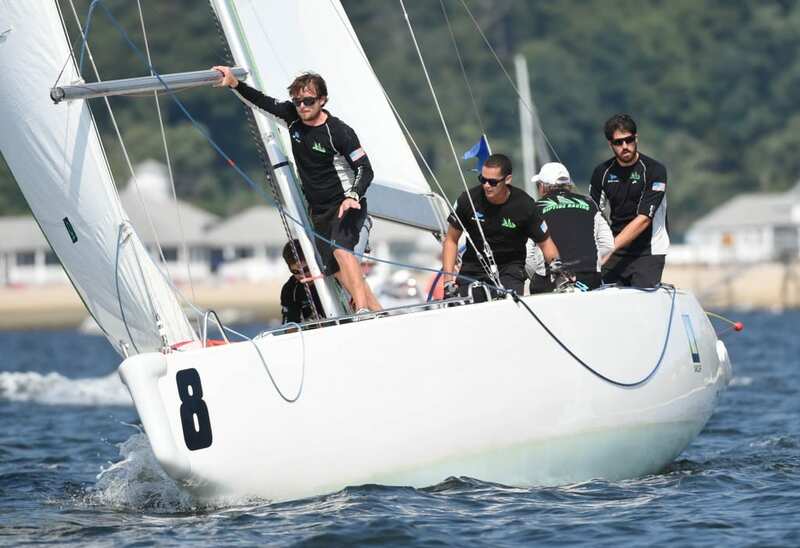 OYSTER BAY, NY (09.06.14) – Aggressive boat handling and high stakes sailing put pressure on the umpire team today as they were pressed to make the correct calls. Quarterfinals saw Dave Perry eliminated when the team fell out of sync after a call didn’t go their way. The winner the match, Eric Monnin, then went to semi finals. Chris Steele progressed through quarters defeating Charlie Lalumiere after an exciting series of races with Lalumiere putting up a strong fight. “The team really rallied together after one loss to Lalumiere in the quarterfinals,” said Chris Steele of 36 Below Racing. Chris Poole and Pierre-Antoine Morvan also advanced to semi finals. Semi-finals got underway with round robin winner Poole taking on this years pre determined winner of the Grand Slam Series Morvan. Poole and Morvan traded blows with Morvan coming out 2-1 in a first to three concluding tomorrow. Thunderstorms brought the penultimate day of racing to an early close but with tomorrows forecast light and shifty the teams will be tested. The ability to change gears and stay focused will the key to success on the final day of racing.